The name of this drink may seem to some to be topical our own times. But, the Gay Divorce Cocktail is found in W. J. tarling’s 1937 “Café Royal Cocktail Book.” The original sense of the name was ‘happy divorce.’ That so, the drink could be just as easily prescribed for anyone experiencing a more modern version of the same. The source specifies the once-famous blanc quina wine sold as Kina Lillet (kina being a cute re-spelling of ‘quina’). That item is not produced anymore. The current incarnation of blanc Lillet is not made according to the classic formula. It is not as good a blanc quina wine as others now available, in my opinion. Instead, I would recommend the bianco version of Cocchi China Americano (china is Italian for ‘quina,’ which word was removed from the label in the U.S.A. to avoid confusing the poor Americans). For the liqueur of bitter orange, I will repeat that I recommend the eponymous bottling of Cointreau (of course), Luxardo Triplum (the best quality-for-money selection), or, my favorite, Grand Marnier Cordon Jaune. That last one is the liqueur that Grand Marnier makes to blend with Cognac brandy to make their better-known Cordon Rouge (technically an orange-flavored brandy liqueur). Since it isn’t distributed in the U.S.A., that selection is more for those in Europe. Orange bitters could be used just as easily as grapefruit bitters in this. The 2014 Edition of the Elemental Mixology Liquor Companion Book is shipping now! Order one right away! On this last Saturday was the session that covers the first part of the punches in the Elemental Mixology Standard Drinks Course. There were nine students present. The Whiskey Sour is one of the most famous short punches of all time, and so I decided to have the students make four different versions of that classic drink, to test their preferences in regards to proportions. Elemental Mixology adheres to the pre-prohibition tradition of making all drinks of a jigger (2 fl-oz.) of liquor, so the amount of whiskey in the drink was not an issue. 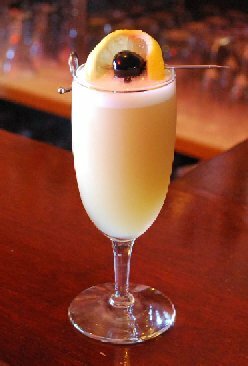 When the 2-1-4 Whiskey Sour was made, a majority of the class indicated that they found the drink satisfactory. Virtually all found the balance between the sour and the sweet to be satisfactory. Some, however, indicated that they would like the flavor of the whiskey to be a bit more pronounced. Only one person in the class thought that the 2-1-8 sour was an improvement over the 2-1-4 sour. A few students felt that it was whiskey-pronounced enough to violate the general rule that the elements in a punch should be balanced. Perhaps a better drink to spotlight the whiskey, but with some lemon flavor, would be the Whiskey Crusta Cocktail with its barspoon (2.5 ml.) of lemon juice hamonizing with the whiskey, rather than trying to balance it. In terms of popularity with the students, the 2-1-8 Whiskey Sour was either the least favored, or the second-least favored. The opinion of the classroom was unanimous. The 3-2-8 Whiskey Sour, however commonly prescribed by bartenders at large, was just too sweet. The entire class found the 2-1-6 Whiskey Sour to be satisfactory. The majority of the students indicated that they thought it was the best proportion of the day. One student still preferred the 2-1-8 Whiskey Sour, and two or three still preferred the 2-1-4 Whiskey Sour. They all agreed that if a bar were to select one proportion to always make for all customers, the 2-1-6 Whiskey Sour would probably be the best choice. Of course, only four variations were tested that day. Perhaps someone will discover an even better proportion and submit it to me for the happy task of trying it myself. This is something that I put together yesterday that I thought I would share. The name means “mixed mezcal.” I use Mina Real Silver as the Oaxaca mezcal and Tapatio 110-proof Blanco as the Tequila mezcal in this. I imagine that Revolución 100-proof Silver would also be satisfactory as the Tequila mezcal. I hope that someone likes it. Today’s drink of the day is the Honeymoon Daisy. It is found in Hugo Ensslin’s 1917 book, “Recipes for Mixed Drinks.” For the liqueur of bitter orange, I recommend the eponymous bottling of Cointreau (of course), Luxardo Triplum (the best quality-for-money selection), or, my favorite, Grand Marnier Cordon Jaune. That last one is the liqueur that Grand Marnier makes to blend with Cognac brandy to make their better-known Cordon Rouge (technically an orange-flavored brandy liqueur). Since it isn’t distributed in the U.S.A., that selection is more for those in Europe. For the Calvados apple brandy, I recommend anything affordable with the words, “Pays d’Auge” on the label. Daron ‘Fine’ is what I use most often in a drink like this. Anyway, here’s the drink. Enjoy! If you are thinking about bringing someone to an Elemental Mixology course, or if you have taken the Brief Drinks Course or Mixology Symposium and want to upgrade to the Standard Drinks Course, visit the Elemental Mixology Discounts page first for a coupon code. Elemental Mixology 2014 Edition – Shipping Now!